On the public safety front: Consumers have reported that the wireless smart meters are causing interference problems with home security systems, motion-sensor devices, baby monitors, wireless routers and cordless phones. In addition to these, they present additional dangerous public safety hazards, sparking fires and explosions. Shouldn’t we require our utilities to make sure they warn us, verbally and with a written warning notice, before installing the meters about these potential problems, who to contact in case this happens, and who will be liable or pay for any repairs, damage and correcting these problems? You’ve read about problems with PG&E’s SmartMeter, especially the folks who claim it’s causing huge increases in their electrical bills. But that’s not the only issue with the vaunted high-tech device. As Pacific Gas & Electric’s SmartMeter installation has rolled across Northern California, dozens of readers have contacted Action Line complaining about newly found erratic behavior with their household electronic gadgets. A conflict occurs, apparently, when the SmartMeter electronically transmits information back to the utility. Cordless phones and crib monitors, patio speakers and wireless headsets are spitting out static and startling pops and crackles, they complained. Also affected, they said, arewireless microphones, security systems, motion detectors and remotely controlled garage doors. This equipment operates largely on the 900- to 928-megahertz radio spectrum. This is something PG&E is loath to talk about even though the company promised transparency when it brought SmartMeters to our homes. When Action Line asked PG&E about the complaints, the utility said little and put up a bureaucratic hurdle to get responses to readers’ concerns, going so far as to require notarized waivers of confidentiality. That’s the definition of stonewalling. PG&E knew it had a problem as far back as early 2009. …Meanwhile the complaints keep flowing in to Action Line, about 60 so far. “A mystery has been solved for us,” wrote Veronica Wong, complaining that her baby monitor has suddenly picked up static. PG&E — which was dinged by the Public Utilities Commission last week for its customer service — has handled this poorly. Radio interference from the SmartMeter and other electronic devices is an irritating fact of life. But when the company brought this device into homes without giving us a choice about whether we wanted it, PG&E owed its customers an honest discussion of what we could expect. Failing to do so has turned an annoyance into a major pain. According to the Central Station Alarm Association (CSAA), there have been reports of wireless security alarms “acting strangely” since the installation of smart meters in their homes. Meters use ZigBee wireless protocol to communicate with smart appliances and other electronics in the home. Want a good reason to have your wireless smart meter removed from your home? PG&E replaced a newly installed wireless smart meter with a traditional analog one when a resident complained that the meter was interfering with her outdoor motion sensor lights at night, and PG&E could not find a fix. That’s one way to hang onto your old analog meter! It was reported in the Marin IJ Tuesday that a Corte Madera resident- Jane Levinsohn- complained to PG&E that after a ‘smart’ meter was installed on her home, her outdoor motion sensor lights were switching on and off for no reason in the middle of the night. PG&E came out and tried using a ‘lower power’ version of the wireless meter, but the interference was still a problem. They eventually replaced it with the old analog meter. Smart meters are on 900 mhz. I am an amateur radio operator and I use 902-928 MHZ. The reason Smart Meters use it…..it is free to use. Your electric company didn’t have to buy a frequency spectrum. So they make out that way. With ALL the interference on that band of course your smart meter is not going to register properly and your electric or gas company gets more money again. It is a win win situation for utility companies. We as consumers lose big time. My Modesto Irrigation District electric bill is up about 90 bucks a month since they installed this so called smart meter. They tell me I am so lucky because my other meter must have been reading wrong and I got off for years, cheaper than I should have. Pure Rehtoric! We need to file a class action lawsuit. At least make them buy a clean frequency spectrum to send the data. In the rush to be leaders, hydro may have cut corners and chosen a meter technology that could instead waste millions, while causing unexpected interference to various wireless equipment, such as cordless phones, crib monitors and patio speakers. Smart Meters use frequencies which are unlicenced, meaning that under the regulations, the channels must be shared with other users, including low-power consumer electronics. Unlicenced equipment is prevented by law from causing interference to other devices, but also has no government protection from interference, even if it causes undesirable operation. …Indeed, smart meters do cause significant interference to 900 MHz equipment, heard as loud pops and crackles up to a hundred times per minute. 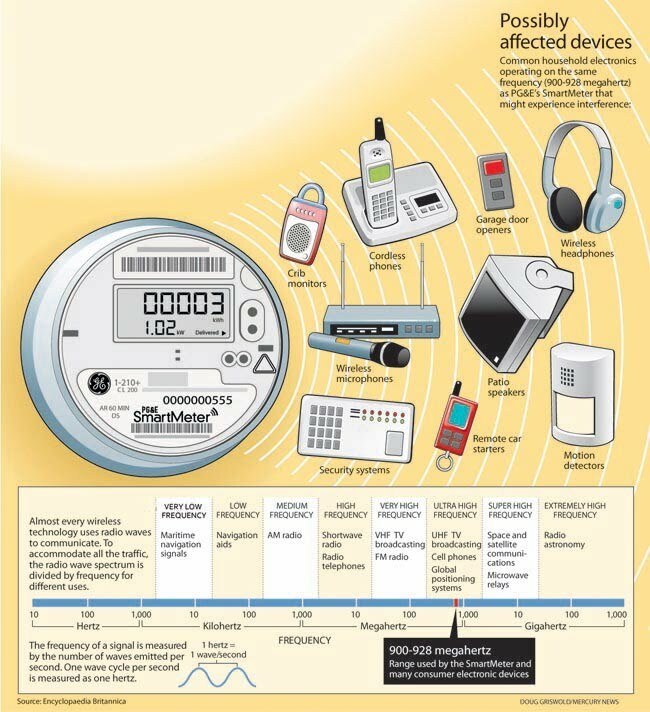 While Hydro has never publicized the fact they knew in advance that these smart meters would likely cause problems to consumer devices, many residents have reacted by discarding perfectly good electronics thought to be malfunctioning. “My phone was popping in my ear so badly I couldn’t hear anyone, so I threw it away and bought a new one,” stated Helene Hanley of Chatham. Unfortunately, contrary to the assertion that users will simply switch to other bands, many new devices continue to use 900 MHz, including some phones marked as 2.4 GHz. The problem of interference is unlikely to go away soon, causing consumers to waste more money on devices rendered useless by the meter involuntarily hung on every home served by Chatham-Kent Energy. …The Smart Meters installed by Chatham-Kent Hydro utilize an unlicenced radio transmitter operating on the 902-928 MHz band to convey data back to the billing system…These meters contain a small radio transmitter, in this case a TUNet module. …Much consumer equipment exists in this band…Most of these consumers are not aware that they are receiving interference from all the Smart Meters within range of their equipment. In many cases, the interference, which causes random loud pops or clicks, renders the devices completely useless to the consumer. ..In one recent sample, over one hundred “pops” were documented in a single minute, and this kind of intensity is observed throughout much of the day and night…The problem with Chatham-Kent Hydro’s assurance that this is “acceptable performance for devices operating in the 900-928 MHZ band” is that it is ILLEGAL to cause this interference in the first place. Industry Canada requires all equipment operating under RSS-210 to cause no interference to other users, including licence-exempt users. …When these rules were implemented, Industry Canada and the various stakeholders which contributed input to the bandplan did not envision a mesh network of 32,000 such devices effectively monopolizing the entire band in a geographic area. The certification is for a single TUNet module, not an entire network. …If an individual or business is suffering from permanent interference which renders their investment in wireless equipment useless, the law supports legal action against the offending source of interference. It is quite likely that the courts would order compensation, or could even issue an order to cease operation. Considering the many thousands of affected devices, a group of cases could be certified for Class Action. ..Chatham-Kent Hydro neglected to consult with the Amateur Radio community, which could have easily alerted Hydro to existing and proposed uses of the 902-928 MHz band. Further, there were no public consultations with the many citizens who own licence-exempt wireless devices operating on these frequencies. Indeed, many people may not even be aware what frequency their devices work on, or even that they use radio signals at all. The average consumer would rely on the honest disclosure by Chatham-Kent Hydro that the Smart Meter program might impact their devices in a noticeable way and render them useless. …Embarrassed hydro officials were summoned before Chatham-Kent council, where they gave a glowing report that was seriously misleading, and promised to help customers experiencing interference. In private, Chatham-Kent hydro told the writer that they had seriously underestimated the interference the meters would cause, but this is not what council was told. They admitted nobody on staff had any experience with radio systems, and could not notch out the interference. Hydro then proceeded to issue press releases promoting their Smart Meter progress, including photo ops with the mayor, and winning an industry award. …I really feel these days that big brother- in the form of the government and corporations working together- is screwing us big time. I hope we can get regulators to pay attention on this as I believe there is a real chance of more people getting hurt if nothing is done. The PG&E Smart Meter has come under fire recently because some customers said their bills have skyrocketed since the new meter was installed, but one north of the river business said their Smart Meter had blown up. Some employees at Henry M.M. Engines said their Smart Meter caught fire, which sparked concern and questioned the safety of these new meters. On Wednesday, a PG&E technician was called out to replace the meter after employees found the device burned up and lying on the ground. “Basically it was an explosion. I saw the meter on the ground and the face plate was blew off and the whole meter was blackened. Even the breaker box that housed the meter was blackened by what seemed to be an electrical short,” said Vernon Nelson, an employee. Another employee wondered how safe the meters are in general, especially for residential families? ABC 23 contacted PG&E who said they are not aware of any smart meters catching fire or blowing up. However the PG&E technician told the employee as he was replacing the meter, that he had replaced at least 15 meters around town due to the same problem they had, said an employee.”I wonder how many houses have burned down because of these Smart Meters catching fire?” said Nelson. Smart meter installations are being blamed for two house fires in Arlington this week.The problem isn’t the meters themselves, but instead what’s happening to electrical wiring. The first fire happened Monday on Brook Hill Lane and the second happened Tuesday on Grants Parkway. Arlington fire investigator Morkita Anthony found that when the old meters were pulled out, the main electric feeds to the houses were accidentally pulled as well. “What it’s doing is making contact somehow with the electric box or the wiring inside and causing a short, which is causing a fire,” Anthony said. A newspaper reported the proposed fix to prevent more such fires in Texas: turn off the house power before installing the wireless smart meter! The Chief Executive Officer of Oncor says the company has a new procedure for installation of smart meters after two house fires in Arlington last week. Robert Shapard says old wiring in two homes could not support the new smart meters. The company now cuts power to the house while the meters are being installed…then as the change is made…electricians check the wiring to make sure there aren’t any problems. In Virginia, a Danville resident reports an explosion on her home, and her fear that her house could have caught on fire and endangered her family and 6-year-old daughter, whose bed is on the other side of wall housing the meter. Pytle called the fire department. Pyrtle she says her problems haven’t stopped. The city repaired the meter and the fuse box, but every appliance plugged in at the time is now broken and she wants the responsible party to pay for them. “I got documentation saying it is the smart meter when I talked to the gentleman at the smart meter,” said Pyrtle, referring to a letter from the city’s insurance company. The letter says, “the cause of the loss is a defective meter and/or the installation by SENSUS”. SENSUS is the meter company. In Australia and New Zealand, consumers have reported electrical shocks from their smart meters due to shoddy and incorrect installations. A recent safety investigation by smart meter installers found electrical hazards in 3,500 homes. The state government has moved to reassure Victorians that the installation of smart meters is being done as safely as possible. However, they have some explaining to do after a report came in this morning revealing that an incorrectly installed meter shorted outpower to a 75 year old man’s home. The Sunday Age can also reveal that, in the course of their work, smart meter installers have identified dangerous and possibly life-threatening electrical hazards in 3500 Victorian homes. Energy Safe Victoria has requested electricity distribution companies provide the names, qualifications and employment details of the hundreds of contractors installing smart meters across the state. ,,,The regulator recently moved to allay fears over the smart meter program, after a Highett woman received an electric shock when her meter was incorrectly installed. It is understood the qualifications of the installer in that incident sparked the regulator’s concerns. …This comes as a Richmond woman has claimed her son received an electric shock arising from the failure of a contractor to check wiring after installing a smart meter in August. Milena Adams said after her smart meter was installed, light globes exploded and household appliances dimmed her lights. She says that in December, her son received a shock when touching a shower tap. The electricity company CitiPower checked her house immediately. And in Canada, a consumer whose house caught on fire wants to know who’s liable? The smart meter on the side of my house caught fire and per the Fire Inspector it was the cause of the fire. Hydro came and took the meter saying it was there property. Who is at fault and if there property burnt my house why should I have to pay my deductible and risk my insurance to go up? Will my insurance go after the Hydro company? Should I get a good Lawyer?